This week I am bringing to you a brand focus on Stila Cosmetics. 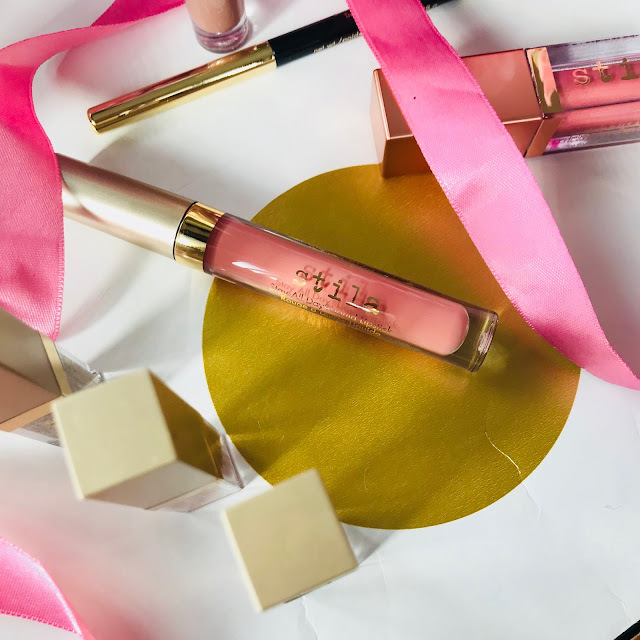 They have appeared on the blog before in my Christmas Stocking Filler Gift Guide and New Year's Eve Makeup Look, however this time I am going to introduce you to some of their key products and new releases for Spring and end with a Spring make-up look, so be sure to scroll all the way down! One thing I love about the brand is how easy their products are to work with. 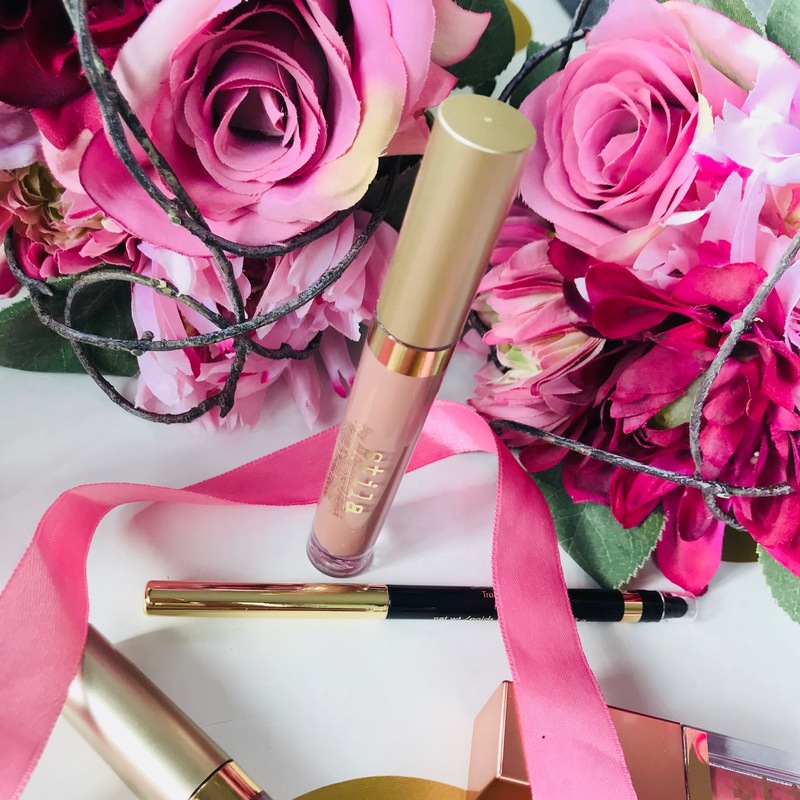 The products speak for themselves and help anyone achieve an effortless make-up routine. 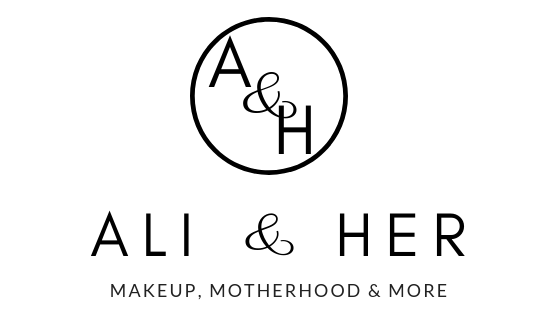 They are fast becoming my favourite make-up brand and something about the brand as a whole really connects with me. First up we have the Glitter & Glow Liquid Eyeshadows. 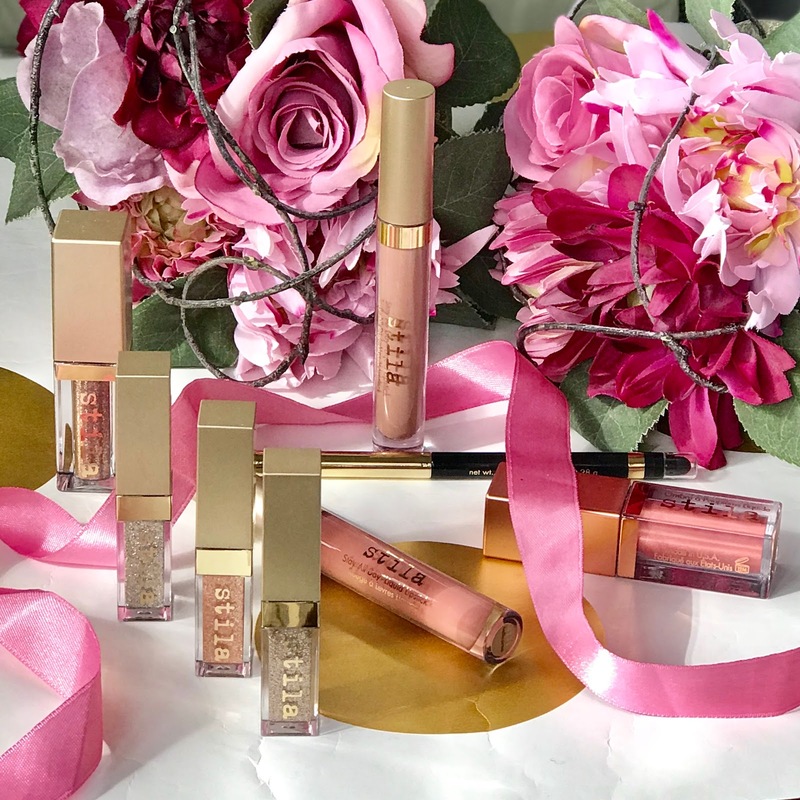 These are one of the products that Stila are well known for. 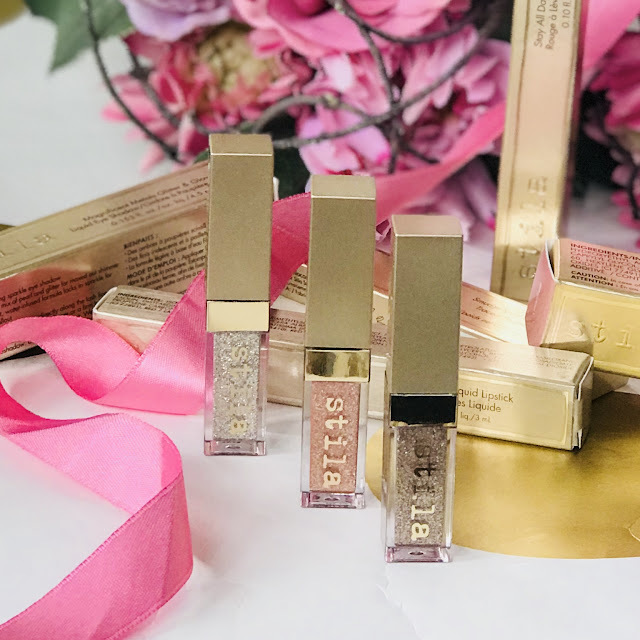 The Glitter & Glow combines glitter and eyeshadow into one product, it applies wet and dries to a powder. No need for glitter glue, it is fuss free, with maximum impact and I think this is what really appeals to me. Below are some swatches from the christmas gift set which contains 3 mini's, however there are a range of over 20 shades. Including duo chrome shades new for Spring. I am obsessed by the way, and want them all. Left to right: Smoky Storm, Kitten Karma, Diamond Dust. 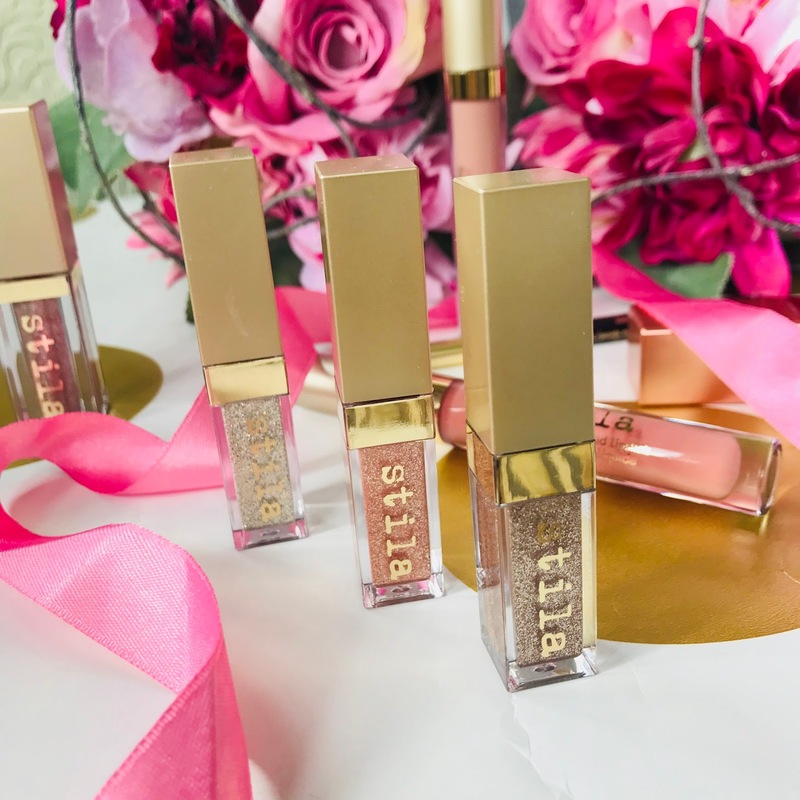 Carrying on with the eye theme, Stila have also released a Shimmer & Glow Liquid Eyeshadow for Spring, as easy to use as the Glitter & Glow but with less of the glitter and more of a pearly shimmer. This is perfect for a less obvious look and gives such a subtle shine, it is soft and beautiful. I love that the colour applies wet and dries to a powder. It also means it is buildable, you can apply a thin layer, or apply more to get fuller coverage. These can also be worn with the Glitter & Glow if you are looking for maximum impact. However on their own they give a pearlescent effect that is so stunning. One thing I find fantastic about Stila is the usability of the products. They are created with ease in mind. You don't have to be a make-up artist to use them but can still get a professional look. An example of this can be seen in the new Smudge Kajal Eyeliner. It is essentially kajal eyeliner with a smudge sponge and sharpener attached at the bottom. The formula is lovely, very waxy and applies smoothly. Perfect for smudging and giving a blended look, but with a high intensity pigment. It comes in four colours and I need them all. 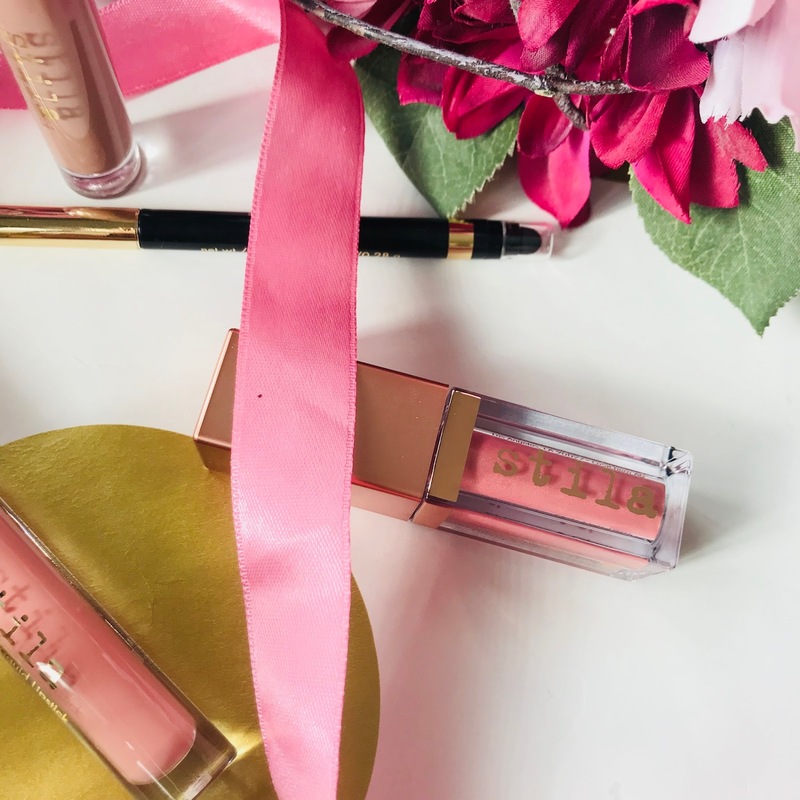 Another classic Stila staple is the Stay All Day Liquid Lipstick, infused with Vitamin E and Avocado oil it keeps your lips hydrated throughout the day. As matte liquid lipsticks go, this is a very comfortable formula, one of the best I've tried. And that is saying something really as I am definitely a gloss girl! For Spring there is also a shimmer version which is metallic and just stunning. Shimmer for the win I say. Also new for spring are the Stay All Day Sheer Liquid Lipsticks, same formula but somehow more transparent and less pigmented. Everyone is so caught up with high impact these days but these are surprisingly nice and lightweight. They offer a light wash of matte colour to the lip, and offer a great compromise for someone who loves a matte lip with a softer finish. If you are looking to jazz your lips up you need to get your hands on Stila's new Glitterati top coat! It is a clear liquid with tiny particles of pearl, perfect to apply over any of the Stay All Day liquid Lipsticks. Perfect for nightwear and gives your lips a little added extra. This is next on my wishlist! 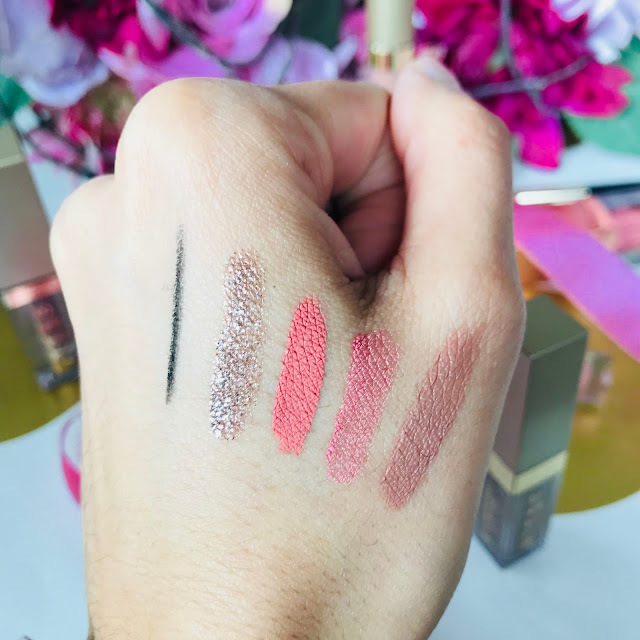 Left to right: Smudge Kajal Eyeliner in Intense Black, Gliter & Glow in Smoldering Satin, Stay All Day Liquid Lipstick in Belissima, Shimmer & Glow in Carefree, Stay All Day Sheer Lipstick in Sheer Caramel. I created my Bohemian Beauty look below with Shimmer & Glow in Carefree over the lid, with a dark brown shadow blended into the crease. Because the liquid dries to a powder you are still able to apply and blend powder eyeshadows to the rest of the eyes. I then applied the Smudge Kajal eyeliner in Intense Black over the lash line and used the smudger to blend it out. 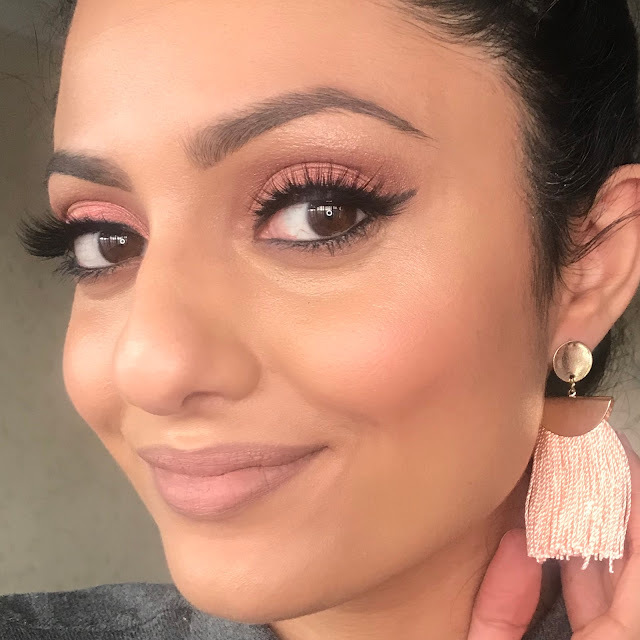 On the lips, I applied Stay All Day Liquid Lipstick in Bellissimo with Stay All Day Sheer Liquid Lipstick in Sheer Caramel over the top to give an ombre effect. I love the fact all the products can be layered to get different effects. Shimmer & Glow Liquid Eyeshadow in Carefree with Doll Beauty Lashes in Brandy. 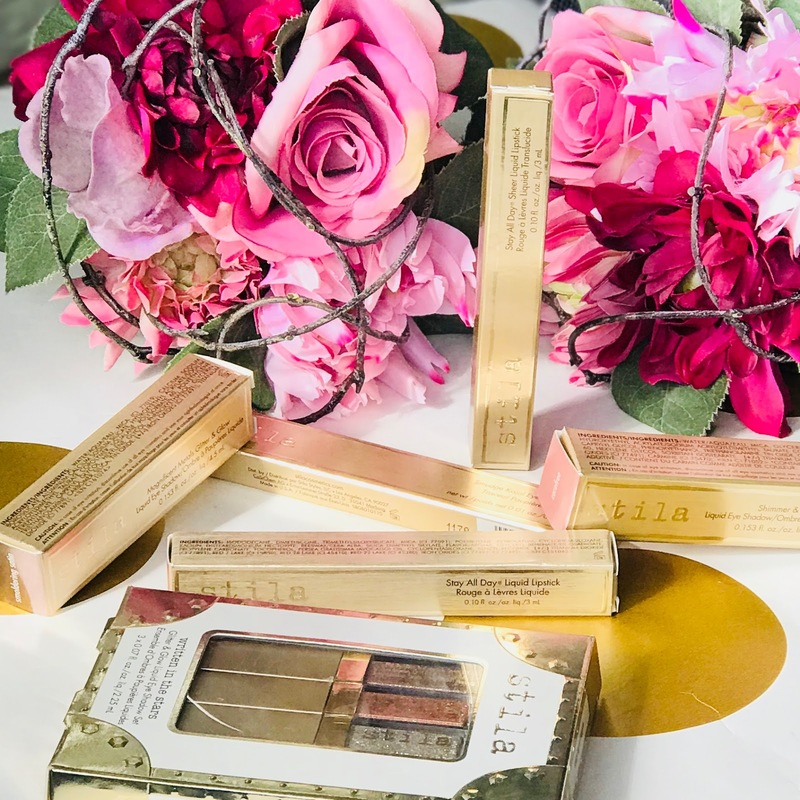 So that's my round up of some of my fave Stila products and some of their new releases. Once again this is a brand I am totally falling in love with and will continue to purchase from. They somehow make beauty and make-up un-intimidating and make it exciting for everyone. 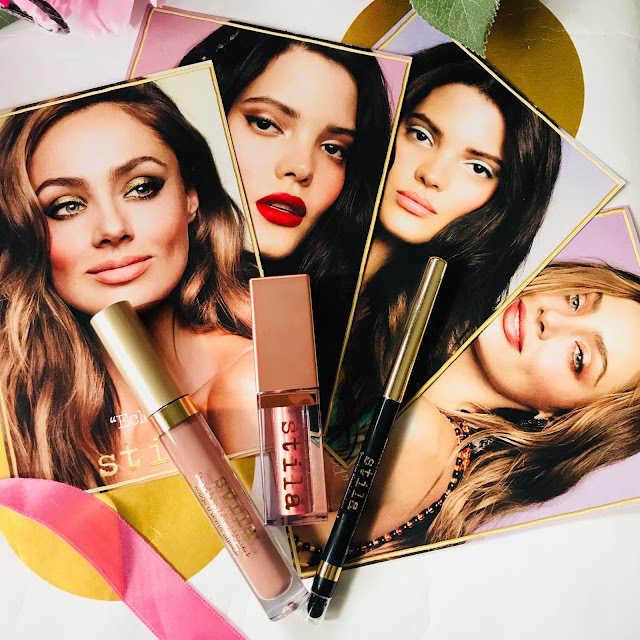 Have you purchased from Stila? What are your faves? Let me know in the comments below. *Contains PR samples. All opinions are my own. Okay, I want it all! Stila are really killing recently. Their glitter eyeshadows are my favourite ever makeup product. That colour looks stunning on your eyes! I didn’t get on with the two original shades I bought but I’m starting to feel tempted by the newer colours now! Another brand I still need to try. 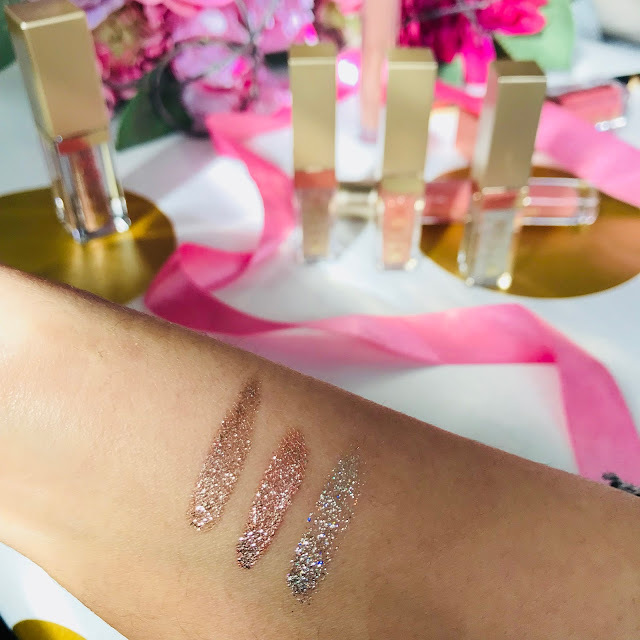 Love the Glitter & Glow Liquid Eyeshadows, they look fabulous! New Glasses with Glasses Direct! Product Empties - To buy or not to buy?